Windsor gives money back to members! This year Council listened to your requests for a simple ‘card access system’ for entry into the club, membership validation, and bring us into line with health and safety compliance. And we researched various systems and came up with a cost-effective solution. What does this mean for you, as a member? just swipe your card to sign-in at reception – no more signing the book. And all this was achieved while keeping membership fees to the same levels as last year – hurrah! The only tennis club in Belfast to hold their prices for the year AND give money back! And don’t forget, the club generously gave each an every member a £10 topup on their card to get you started! Every member, with the exception of juniors, has been issued with a swipe card, and to swipe when entering the club. Now, with winter approaching and the dark winter nights it’s essential that members carry their cards with them at all times as the green gate will be closed over the dark winter period. But I haven’t collected my card yet?? Don’t worry, you’re not alone. 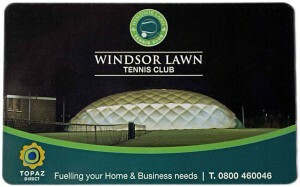 All you have to do is contact reception receeption@windsortennis.co.uk and arrange to pick it up – what could be easier than that- and you are free to use your card right away. Ten pounds already on your card. If you have any questions respond to reception@windsortennis.co.uk or enquire when you are at reception.